In my previous post, we had measured the iPad's "adjusted" market share in Q3 by estimating the expected QoQ growth in the absence of iPad Mini rumors. Let's use this "adjusted" figure to measure latent demand for the iPad Mini and see if it has any bearings on our previous cannibalization estimate. 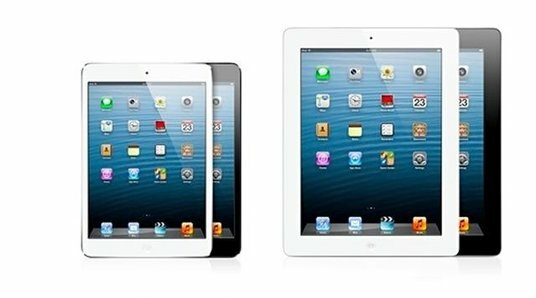 Apple CEO, Tim Cook, stated that iPad sales in Q3 saw a slowdown which was partially driven by iPad Mini rumors. Our "adjusted" iPad market share figure is based on the number of iPad purchases that were delayed because of iPad Mini rumors. The quantum of delayed purchases would give us an idea of the minimum latent demand for the iPad Mini. As I had explained previously, the figures in the chart above are based on an estimated QoQ growth of 10-15% as opposed to the 18% sequential drop in iPad shipments. Surprisingly, as channel inventory had remained nearly flat from Q2 to Q3, the iPad product refresh had no impact on shipments. Also, the launch of the upgraded, fourth generation iPad was a surprise and hence, did not have an impact on the shipment slowdown in Q3. Now, even though the shipment slowdown was not caused by the "iPad 4", it is possible for a few buyers that were holding out for an iPad Mini to be swayed by the iPad 4. In fact, that was the primary reason why Apple chose to upgrade the iPad within 6 months. However, it is unlikely to sway more than 15-20% of iPad Mini hold-outs. This suggests that of the 5.1 million hold-outs above, more than 4 million are likely to purchase an iPad Mini, after delaying their iPad purchase in Q3. 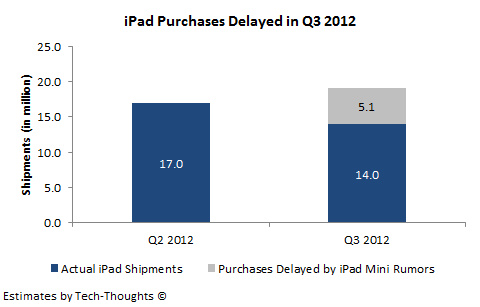 Any iPad Mini sales in Q4 to buyers who delayed an iPad purchase in Q3 are essentially cannibalized sales, i.e. 4 million as per our latent demand estimate. Supply chain checks hint that 9-10 million iPad Mini units will be manufactured (not shipped/sold) by the end of 2012. These figures are in line with our cannibalization estimate, i.e. a minimum of 50% of iPad Mini sales will be via cannibalized iPad sales. I hope these figures also help clear up any confusion caused by surveys that confuse cannibalized sales with replacement sales. These cannibalization and latent demand figures will be key components of our iPad sales estimate for Q4.